Here is a photo, Bierre prestige, Prestige beer is an imported lager beer from Haiti. 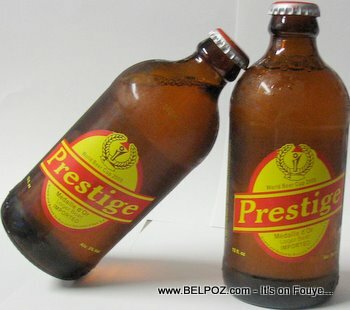 In Haiti, Prestige is the beer or choice amongst the beers of the world. ... a beer called Prestige, made in Port-au-Prince by the Brasserie Nationale d'Haiti, this lager compares very favorably with the mass-market brews that come from such major companies as Anheuser-Busch and SAB Miller. In 2000, Prestige won a gold medal in the World Beer Cup in the category of American-style lager. Take a sip and you'll understand why. Prestige is light and crisp, with a modest amount of malt and hops, which are nicely balanced. This is not a rich or powerful beer, but if you want a slightly more flavorful option in the style of Bud or Miller, Prestige is a good choice. Se vre ou se pa vre?